You can look great and have a healthy smile! Most people who are unhappy with the appearance of their teeth do not realize the numerous ways cosmetic dentistry can heal a smile. Cosmetic dentistry can correct crooked teeth, spaces between your teeth, stained or discolored teeth, chipped teeth, broken or missing teeth and having a "gummy" smile. Dr. Olsen creates a customized treatment plan for you, based on your age and goals for your teeth, as well as your finances. Imagine a whiter, more brilliant smile! Porcelain veneers are cosmetic dentistry that make a dramatic difference in the appearance of your teeth. If you have chipped teeth, crooked teeth, gaps between teeth or dull or stained teeth, veneers may be the perfect solution for you. After a little tooth preparation, Dr. Olsen will bond and shape thin porcelain veneers to the front surface of your teeth, creating a straight, brilliant smile that enhances your appearance and your self esteem. You can have the confidence that comes from a bright, white smile. If you are happy with the alignment and spacing of your teeth, a tooth whitening procedure may be all that separates you from a dazzling smile. Tooth whitening is safe, effective and long lasting. There are two main methods to get excellent results: a custom home tooth whitening kit or an in-the-office procedure. Your custom home whitening kit includes a special tray that is customized to fit over your teeth. You also receive prescription whitening gel, which is inserted into the tray before you wear it. Dr. Olsen gives you detailed instructions about how long you should wear the tray each day and you should expect the entire home whitening process to take between two and four weeks, leaving you with a dazzling smile. If you desire immediate results, visit Dr. Olsen for an in-the-office whitening procedure. Again, the treatment utilizes a much more powerful whitening gel, giving you amazing results in about an hour and a half! You will also get a special tray to continue the whitening at home whenever you want to brighten your smile. Sometimes gum disease, injury, decay or simply everyday wear results in the loss of a tooth. 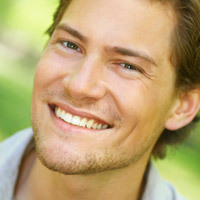 A missing tooth or teeth can create significant problems for your dental health if not corrected. Over time your bite pressure may shift to other parts of your mouth to compensate for an inability to chew efficiently in the area of the missing tooth. Neighboring teeth may begin to move into the open area and result in discomfort, pain and more problems down the road. Bridges made of porcelain "bridge the gap" in your smile. Dr. Olsen can create a lifelike, functional bridge to correct your smile, restore your bite and alleviate your discomfort. A bridge is created out of metal, alloys and / or porcelain and utilizes the teeth on both sides of the gap as its supportive structure. After some preparation of the two neighboring teeth, crowns are created for them. A porcelain tooth is fused between the crowns to replace your missing tooth, completing your smile and restoring comfortable, natural function. A porcelain crown from Dr. Olsen is a custom-made tooth, made out of porcelain, that is placed over your own natural tooth (after a little preparation). When you have a tooth that has been worn or damaged in such a way that a filling cannot restore enough tooth structure, a crown is placed to complete your smile and restore your ability to chew. Since the crown is custom made for you, it will be indistinguishable from your natural teeth, and will function so naturally that it feels fantastic. Whether you require one or several crowns, you can rest assured that your smile will look incredible. When the decay has been taken out of the tooth, it is replaced with "filling" material. In the past, amalgam (silver) fillings were placed into the cleaned out portion of the tooth. With advancements in dentistry, you can now have tooth-colored fillings instead of silver fillings. Tooth-colored fillings are bonded to your tooth, creating a durable seal that protects your tooth from future damage. You may even elect to remove all your old silver fillings in favor of new, undetectable tooth-colored fillings. Bonding refers to the placement of tooth-colored resin to correct chipped and broken teeth, discolored teeth and in some cases, space between teeth. Dr. Olsen expertly shades and sculpts the resin to match your ideal natural tooth color, while enhancing the shape of your smile. Like a natural tooth, the resin may stain with the use of coffee or other staining foods, so – as with all cosmetic restorations – good hygiene habits are important. Contact this Mesquite Dentist today.